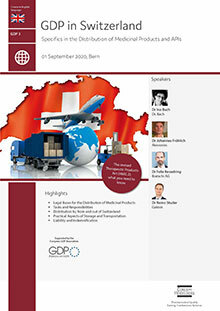 Learn and discuss how to manage your distribution activities GDP-compliant. Exchange opinions and convey possible solutions to problems addressed in case studies. Quality requirements for medicines do not end after production and packaging. Medicines and APIs are often shipped over long distances and different climate zones and stored in various warehouses. Once the WHO has taken the lead with its guidelines „Good Storage Practices for Pharmaceuticals“ (2003) and „Good Distribution Practices for Pharmaceutical Products“ (2010), more and more compliance with good storage, transportation and distribution practice was emphasised worldwide. Another milestone were the EU-GDP guidelines from 2013 with a lot of intensified demands. For quite a while it was rather unclear how these guidelines are applicable in the non-EU country Switzerland. Under the Agreement of 21 June 1999 between the Swiss Confederation and the European Community (Mutual Recognition Agreement, MRA), Switzerland obliged to comply with the EU-GMP regulation. However, GDP was not covered. Since 1 July 2015, the EU GDP guidelines do also apply for Switzerland (final implementation on January 1st 2016). This was realised through an adaptation of Annex 2 of Ordinance on Establishment Licences (Arzneimittel-Bewilligungsverordnung - AMBV or Ordonnance sur les autorisations dans le domaine des médicaments - OAMéd). Now, on 1 January 2019, the revised Therapeutic Products Act (HMG 2) and the majority of the revised implementing ordinances (Therapeutic Products Ordinance Package IV) came into force - with some interesting changes. This course has been designed for employees, specialists and managers from storage, transportation and distribution as well as their colleagues from quality control, quality assurance and production, which are involved in the various processes of drug logistics.